striking about 33,000 Australians every year? because life-saving equipment is not available. Sudden Cardiac Arrest is an issue that affects all of us. It does not discriminate; it can strike anyone, at any age, anytime, anywhere – without warning. Three quarters of cardiac arrests happen outside of hospital and survival depends on bystanders taking action. It is the one cause of death that anyone can reverse, without first aid training, by quickly applying an Automated External Defibrillator (AED) to the victim. The problem is there are too few AEDs available in the community and workplace, and too few people who have the confidence and knowledge to apply them. AEDs are easy and safe to use. If an AED is applied within the first few minutes of having a cardiac arrest your chances of survival can increase to over 80%! Without early defibrillation, your survival drops by 10% for every minute of delay. 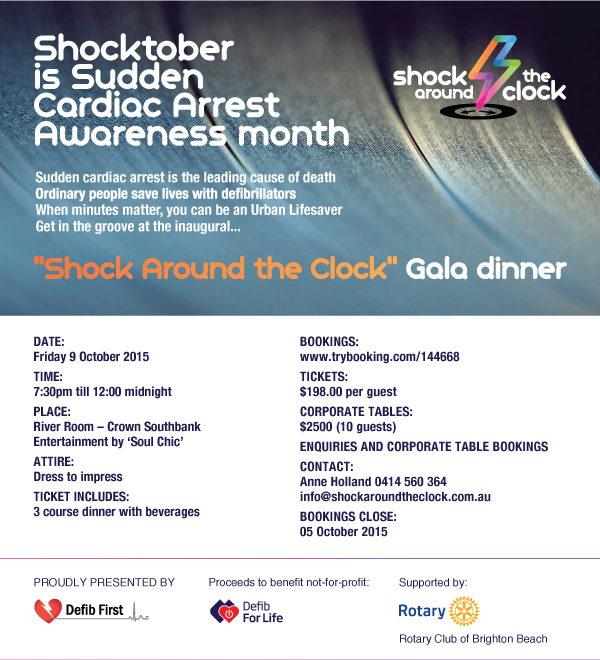 ‘Shocktober’ is Sudden Cardiac Arrest awareness month and ‘Shock Around The Clock’ will be the inaugural fundraising event designed to raise awareness about Sudden Cardiac Arrest and the critical importance of early defibrillation by bystanders. Minutes matter and anyone can be an Urban Lifesaver, if they just know how! Congratulations to Jason Proposch of Connectme.com who won the Kindle reader prize for completing the Defib First survey "How much do you know about Automated Defibrillators?". Survey is still open - please test your knowledge! !